Asia’s top HR leaders have seen dramatic changes across the human resources management landscape over the past five years. Each year, the region’s most prestigious event for senior HR executives, the HR Leaders Summit, will present the latest opportunities, dynamic solutions, and business strategies HR can explore to keep pace. The ultra-exclusive, invitation-only conference will be held at the Renaissance Phuket Resort & Spa on the island of Phuket in southern Thailand on 16-18 May 2016. “The well-researched topics, phenomenal speakers, and the unique setting of the HR Leaders Summit are some of the reasons why the conference continues to attract the cream of Asia’s most senior HR practitioners,” said Aditi Sharma Kalra, regional editor of Human Resources magazine. Last year, HR Leaders Summit delegates experienced interactive learning with noted company executives and key influencers in the industry. Their presentations examined strategies in applying HR transformational solutions, uniting business strategy and HR strategy, and integrating technology and human resource processes. One of the highlights last year was a panel which explored the relationship of talent investment and business success and ways organisations can succeed in a hyper-competitive talent marketplace, from employee retention to talent processes. The HR Leaders Summit 2015 treats all delegates to a gala dinner where they were able to network and spark collaborations with industry peers. Other critical topics tackled throughout the conference were the fundamentals in building a cross-cultural and inclusive work environment and approaches in shaping a compelling employee value proposition to increase productivity. Roundtable discussions closed the summit last year with topics ranging from the future of HR technology to the development of workforce planning models. Now in its 5th year, the HR Leaders Summit will introduce a spectacular line-up of HR gurus and business leaders who will share key industry perspectives and their accomplishments in HR strategy. This year’s agenda is designed for the modern HR leader, covering the most pressing issues and trends: the different faces of leadership in the age of disruption, principles of CHRO strategic positioning, the importance of brand in the digital age, and the link between talent innovation and business strategy. The HR Leaders Summit 2016 will keep its well-received in-residence retreat style vibe that complements the program’s keynote presentations, panel sessions, lunches, dinners and cocktail receptions. “The HR Leaders Summit has become the most anticipated gathering of the pillars of workforce management,” said Jenilyn Rabino, regional production lead at Human Resources magazine. Open only to 50 heads of HR with regional responsibility from Asia’s biggest employers, the HR Leaders Summit has been the most senior annual gathering of HR leaders for the past five years. 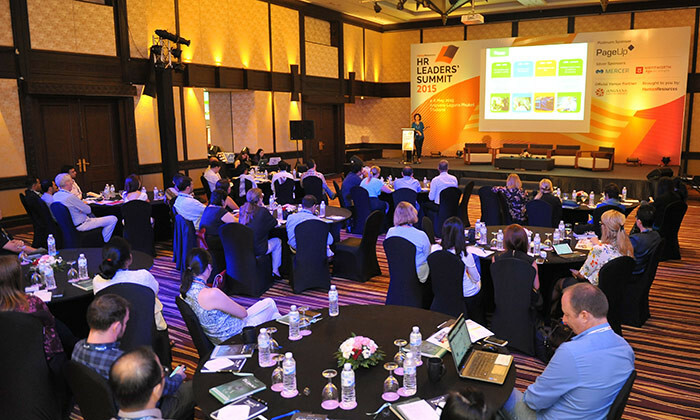 Held in Phuket, the HR Leaders Summit is a 3-day in-residence conference where the region’s most senior HR professionals can interact with like-minded professionals in a relaxed environment. Past HR Leaders Summit attendees are top HR managers from large companies such as Abbott Laboratories, American Express, ANZ, Facebook, Citibank, Hershey Company, ING, Manulife, Pepsico, Roche, Rolls-Royce, Sime Darby, Standard Chartered, Swire Pacific, Zalora and many more. All presenters & panellists, such as Ajit Nambiar, head of compensation – international at Google, are director or vice president level HR professionals with regional responsibility. To be held at the luxurious Renaissance Phuket Resort & Spa on 16-18 May 2016, the HR Leaders Summit is Asia’s most senior gathering of the HR leaders who set Asia’s human capital agenda. The three-day annual conference is a rare opportunity for top HR leaders to discuss high-level human capital strategy with genuine peers at their level. Attendance to the HR Leaders Summit is complimentary but limited to 50 heads of HR on an invitation-only basis. To review the topics & agenda, check out the stellar speaker list and request an invitation, visit www.hrleaderssummit.asia or contact Jenilyn Rabino on +65 6423 0329 or jenilynr@humanresourcesonline.net.